The request follows the resignation of former White House staff secretary Rob Porter, who was using one. Senate Democrats asked the FBI on Wednesday to give them a full list of White House staff working under interim security clearances. House Democrats also drafted a letter requesting clarification on the clearance process. In a letter to FBI Director Christopher Wray, Senate Democrats said Wednesday, "We write out of concern regarding the White House's troubling reliance on the use of interim security clearances." The letter was drafted on the heels of former White House staff secretary Rob Porter's resignation. He left amid accusations of spousal abuse and was working on an interim security clearance, according to the White House. An interim clearance is suppose to prevent access to the highest levels of top-secret information. Porter's job involved funneling information to President Donald Trump — some of which would have been at the highest classification levels. It's not clear how Porter handled that intelligence without a permanent clearance. 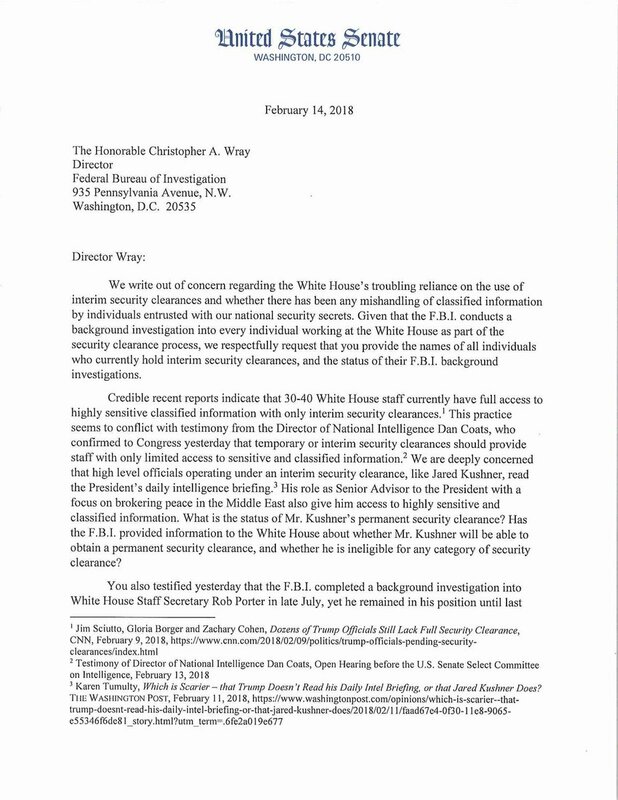 The letter also claims, "Credible recent reports indicate that 30-40 White House staff currently have full access to highly sensitive classified information with only interim security clearances." Certain staff members can receive interim clearances while their background checks are being completed. The White House and the FBI have conflicting statements about whether Porter's check was complete. Rep. Ted Lieu also introduced a piece of legislation Wednesday that would let Congress oversee the clearance process.